Ceramic Non-Stick Coated 10" Pan for Just $12.49 Shipped! You are here: Home / Great Deals / Ceramic Non-Stick Coated 10″ Pan Just $12.49 Shipped! B2G1 FREE! Get A Free Mag Subscription! Ceramic Non-Stick Coated 10″ Pan Just $12.49 Shipped! B2G1 FREE! Get A Free Mag Subscription! This is a great deal on a non-stick pan. Order a Ceramic Non-Stick Coated 10″ Pan for Just $12.49 Shipped! Buy 2 Get 1 FREE! Then the price is just $8.33 each! 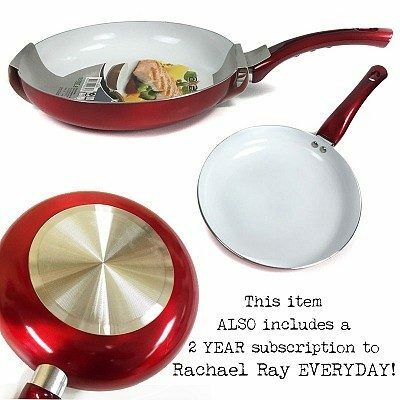 Even if you buy just 1 pan you get a FREE 2 year Subscription to Rachael Ray Everyday! The Axentia Hot Rod Red Ceramic Non-Stick Coated 10″ Pan will quickly become your favorite go-to for getting things done in the kitchen. A strong & durable nonstick finish promises effortless food release, while even-heating bases dish out perfectly prepared meals. Click here to check out more Great Deals!